Cordyline australis with its mop top head is commonly called the ‘Cabbage Tree’. Originally from New Zealand it is widely grown throughout Australia and can reach 10 – 15m in height. It is the cultivars with colourful foliage that have come to the forefront in recent years. 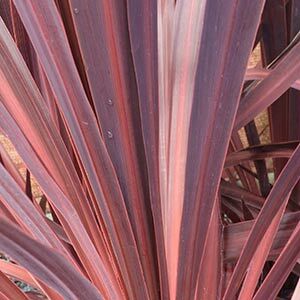 Cordyline australis has thinner or finer foliage that other species. A trunk forming plant, over time it does form a large root system so is best planted away from paths etc when grown in the ground. Cordyline australis is often grown as a container plant, and works well as a feature plant in these conditions. More suited to cooler climates than some other species. Although the species can reach 15m + in height, many of the cultivars are said to be lower growing, many only to 4m. Check with the wholesaler on estimated height. C. australis ‘Red Sensation’ – Deep Red foliage. C. australis ‘Black Knight’ – Deeper purple foliage. C. australis ‘Sundance’ – Very attractive red to orange lower foliage turning to green near the tips. C. australis ‘Purple Tower’ – Another with purple foliage. C. australis (australe) Torbay Dazzler is a fast growing cultivar with sone coloration in the foliage.